Raincoats. The word itself springs to mind those bright yellow PVC monstrisities that you wore as a kid that would work in the rain, but would cause to you sweat more than you would get rained on so you end up sweaty instead. Umbrellas are a great choice, but sometimes you need the convinience of having your hands free so you're back at the debate of clunky vs sweaty. In comes... the Stormshell Jacket. What is a Stormshell Logo Jacket? 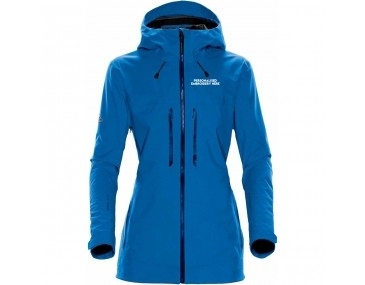 Stormshell is a kind of hardshell jacket that is equal parts waterproof and breathable. With these jackets, you are able to have the comfort of both hands free, and breathability that isn't provided by your standard PVC raincoat. One of the key factors that tipped the scale for me for these jackets are their range of wearability. These are rated from -10C to +10C. Usually when it is raining, it is winter and having that kind of jacket that is both warm, weatherproof AND breathable and that is exactly what tipped the scale for me. Though as of writing this it is the hright of summer, where a day that is under 27 degrees is a cool day, being able to have this in my wardrobe means that when winter rolls around, I don't have to worry about trying to find something that will meet my needs after I need them. Being able to brand your own jackets means that you can hand these jackets out to your team, advertising your brand while at the same time wearing their favourite jacket. To me, this is the definition of a win-win. We are able to put your branding straight onto these beautiful jackets, making your next promotional venture practial along with effective. So grab logo branded Stormshell jackets for your entire team today, and do yourself the favour.